Sept 1st ... Time Flies! It's labor day today here in US, a holiday observed on the first Monday of September which means "a day off for the working citizens", not sure if every working citizens would take a day off". My husband would take a day off today so I'm glad, we could have more time for each other. We do not have any plans for today, but we'll try to find something we could do to make our day pleasurable. ......Not much happened this weekend, except for the visit that we did at my in laws and a birthday party (Madelyn Christensen 5th birthday) that we attended last Saturday(Aug 30). But anyway, for those who don't know, Today-Sept 1st labor day is the symbol of the end of summer, the end of vacation, the beginning of school, and the beginning of fall. Time flies, next thing you know it's already Christmas, then New Year 2009. Try as we may, we cannot stop it and we cannot slow it down. So Enjoy today.... because time flies. Happy US Labor day!!! yes, time flies quickly. only 155 days to go before christmas. yikes! 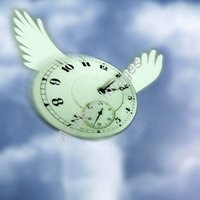 Time has a golden wings talaga hehehe. We celebrated our labor day as part of our summer getaway. although nasa Korea kami, we still celebrated it. Can't wai till we go back to States!